Today's workforce is changing at an incredibly rapid rate as transformations in society, government, culture, technology, communications and the legal landscape impact employers and the workplace. As we approach 2019, the workplace will continue to be shaken up and employers are in for more changes as new and different challenges emerge. In an effort to help employers prepare to meet new and upcoming challenges, XpertHR conducted its annual survey in the Fall of 2018, asking HR professionals for input and insight as to what they anticipate will be the most critical HR compliance challenges in 2019. With over 800 responses from a wide variety of employers and industries in all geographic areas of the country, the responses guided us as we compiled the top HR challenges for 2019. 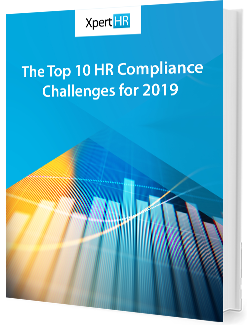 This guide will provide you with the most challenging HR compliance issues, top employment law trends of 2019, and tips and strategies on how to respond to and prepare for these challenges.